Fairy Tail is one of those series that isn't particularly well known here in Australia, but those who do know about it think it is brilliant. Hiro Mashima (Rave Master) writes and illustrates the manga series of the same name, a series that was the 4th best selling title in Japan last year, won the Kodansha Manga Award in the Shonen category in 2009 and was listed as the best shonen manga of 2008 by Deb Aoki of About.com. This series is without a doubt one of my favourite ongoing manga series but does the animated series live up to my expectations? Find out after the jump! "Lucy is a 17-year-old girl, who wants to be a full-fledged mage. One day when visiting Harujion Town, she meets Natsu, a young man who gets sick easily by any type of transportation. 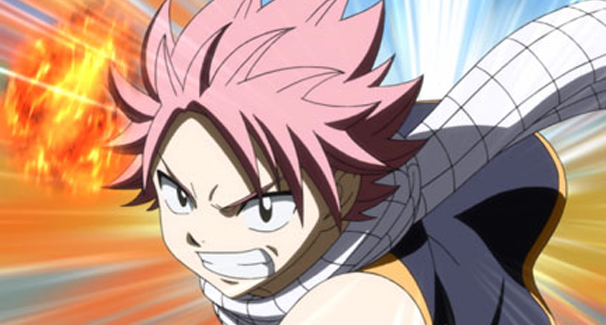 But Natsu isn't just any ordinary kid, he's a member of one of the world's most infamous mage guilds: Fairy Tail." Many people have drawn comparisons between Fairy Tail and the most successful manga/anime property of all time, One Piece. It has been confirmed that there are no links between Hiro Mashima and Eiichiro Oda. They have never worked together and neither claim to be inspired by one another. They do, however, admit to being heavily influenced by the creator of Dragonball and Dr. Slump, Akira Toriyama. Certainly there are similarities between Fairy Tail and One Piece in so much as they have ridiculously strong and ridiculously ridiculous main characters and a varied cast. That said, the same could be said for many other shonen series like Blue Exorcist, Kekkaishi and even Naruto. 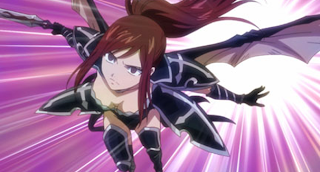 The cast in Fairy Tail are many and varied and all the while being thoroughly likeable. One noticeable difference between the anime and manga series is that the manga manages to build a more immersive world which feels surprisingly richer than its animated counterpart. Perhaps this is due to the quickened pace of the animated series as opposed to the manga, if an animated series doesn't grab its audience it gets cancelled. Our leading man, Natsu, is an incredibly powerful fire user and member of the wizards guild Fairy Tail. Fairy Tail in itself is a rogues gallery of weirdos whose hearts all appear to be in the right place. Another Fairy Tail member, Gray, is an ice user and in many ways the antithesis of Natsu. Always at each others throats they are a source of constant amusement but it's still glaringly obvious that Fairy Tail are thick as thieves. As varied as the characters are (there's even a flying blue cat!) so too is the voice work. The Japanese version of Natsu is played by Tetsuya Kakihara (Gundam UC & Gurren Lagann) while the English dub is supplied by Todd Haberkorn (Chaos;Head & Rosario + Vampire). Both of these leading me nail the action hero AND slapstick elements of the role which allows for a well balanced storyline which isn't a relentless chucklefest. 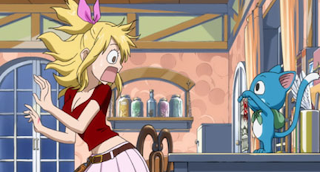 While still comparing this series to One Piece, Fairy Tail manages to be a touch more grown up with heartfelt moments and an underlying story that hints toward something huge on the horizon. The animation quality is generally of a great standard although some of the fill in is a bit hit and miss. Studios A-1 Pictures (Black Butler) and Satelight (Hellsing Ultimate) have done a great job overall, especially considering that lengthy series such as this tend to be made slightly cheaper than single seasons or OVA's. CGI is commonly used when guild members use their powers and although the effect is rather spectacular, it cast an all too stark contrast against the traditionally painted animation. Madman's Blu Ray release is very crisp to the point of being faultless and the colour contrast makes everything pop. The animation may not be the best around but what is on the screen is presented beautifully. It can be difficult and daunting to embark on such a long journey, to date 116 episodes of Fairy Tail have been released. That said, this is a great jumping on point for a fantastic anime series which is based upon an equally fantastic manga series. I can't wait for the next collection! Fairy Tail Collection 1 is available on DVD and Blu Ray now and Collection 2 is available for preorder and to be released on February 15th.